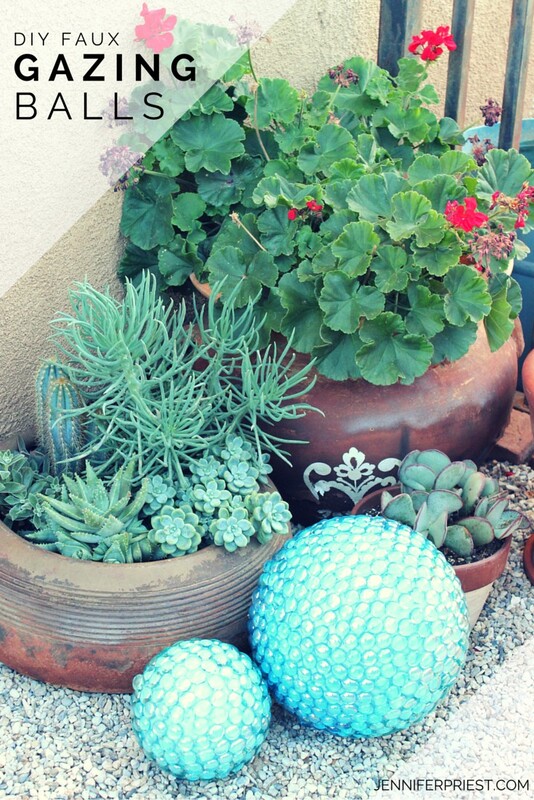 We are gonna rock this DIY Gazing Ball for your Garden. I'm so glad you want to make your garden look pretty (for less)! I REALLY want you to have a pretty spot in your garden just like this too! Click this video to get started. 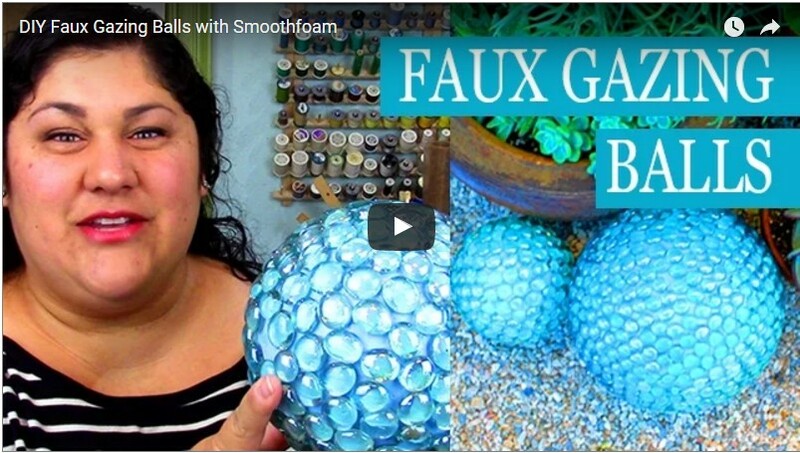 You can make these gazing balls too! This post contains affiliate links. Product was provided by Plasteel Corporation. Sorry that happened – I suggest construction adhesive if you live in a wet weather area. I live in a desert – it rarely rains here. Also you have to use SMOOTHFOAM because if you use styrofoam, it will fall apart right away. You must use a weather-proof (water proof) glue. Love these! Way cute. I’ll have to make some once we get a place here in Arizona. ? Love this idea! Work at Jo-Ann’s and know what I am buying tomorrow after work. Want to do the green pebbles and putting on the thinking cap for the color paint. Don’t want a glitter but something to really add to it. Looks great, and your planters too! Thanks for sharing on craft schooling Sunday! What a great idea! They came out really beautiful. I found you at Share it link party! Made these yesterday and love them. However, I wonder how they will hold up in the summer weather? Does water have a negative effect? Yay so excited that you made them! Some of the beads might fall off with extreme temp changes -Just glue them back on 🙂 You can also use a construction adhesive to hold them on. Yeah I don’t really think that would work … but interesting idea! 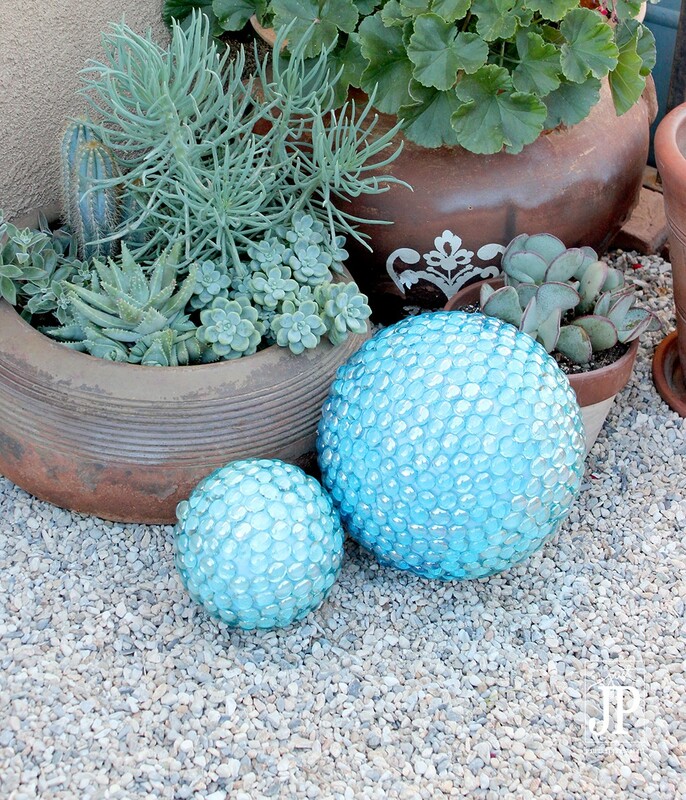 I may try making this with some old bowling balls we have lying around….no need to paint them just add some sparkly flat marbles. ball one color and use flat marbles of another. It might be gaudy or could be interesting. Any opinions? You totally could do that! Just made my first one. Painted the ball sky blue and used clear flat marbles. Beautiful. I’m wondering. How could I fill in the open spaces with seed beads, bugle beads etc.? What kind of glue should I use? hOPE YOU RESPOND soon. Can’t wait to put in my hosta garden. Oh, I found a lot of cool stands at Good Will. Similar to fondue pot stands. Ge silicone 11 in clear. Hello, They are heavy with the glass marbles on them. These are awesome! I have gazillion of those glass pebbles leftover from my daughter’s wedding. I can’t wait to try this. (1) Would this Smoothfoam (never hear of it before) work with silicone as an adhesive instead of hot glue? Then it would be weather resistant. What is construction adhesive? Is there a tube you could use as clear caulking? Go to the hardware store and ask for clear construction adhesive. You could use clear caulk if it is for outdoor use. Click the link in the post – goes direct to Amazon. Also JOANN Crafts has it. Super cool! I found this post on Pinterest and my shade garden sure could use that pop of color. Thanks for the additional information about temperature extremes as I live in South Florida! You might try old bowling balls…. you can usually find them at thrift stores, bowling ally’s often sell for a buck….. paint it white and glu away. It is heavier but I have had on inmy garden in Colorado for 7 years! Jennifer, can you use rubber balls or hard plastic balls that children play with for the glazing ball? Bowling balls are hard to come by and I want to make several for outside. I live in NJ so our summers can be hot and humid. I would take them in for the winter. Hello, approx. how many flat marbles would it take to cover a bowling ball? Solution….over glue gun it and let it warp around the glass beads….or later super glue them back in place. Can the smoothfoam and stained glass mosaic ball be grouted? What type? Hello, you probably could but for something more permanent, use a bowling ball or concrete ball as a base. What a fun idea! I bet they look so pretty when the sun hits them, too. Thank you for sharing at Merry Monday! These are so pretty. I can see how they can be used inside or out. The best part is you tell us what to use for each application. They really are pretty! Thank you so much for sharing these pretty gazing balls with us at the Hearth and Soul Link Party. Have a lovely week!